Cluster headache is a primary headache disorder affecting up to 0.1% of the population. Patients suffer from cluster headache attacks lasting from 15 to 180 min up to 8 times a day. The attacks are characterized by the severe unilateral pain mainly in the first division of the trigeminal nerve, with associated prominent unilateral cranial autonomic symptoms and a sense of agitation and restlessness during the attacks. The male-to-female ratio is approximately 2.5:1. Experimental, clinical, and neuroimaging studies have advanced our understanding of the pathogenesis of cluster headache. The pathophysiology involves activation of the trigeminovascular complex and the trigeminal-autonomic reflex and accounts for the unilateral severe headache, the prominent ipsilateral cranial autonomic symptoms. In addition, the circadian and circannual rhythmicity unique to this condition is postulated to involve the hypothalamus and suprachiasmatic nucleus. Although the clinical features are distinct, it may be misdiagnosed, with patients often presenting to the otolaryngologist or dentist with symptoms. The prognosis of cluster headache remains difficult to predict. Patients with episodic cluster headache can shift to chronic cluster headache and vice versa. Longitudinally, cluster headache tends to remit with age with less frequent bouts and more prolonged periods of remission in between bouts. Cluster headache (CH) is a debilitating primary headache disorder. Although uncommon, affecting only 0.1% of population, it is one of the most painful conditions known to humankind. Three strategies are employed for effective treatment of CH, namely, abortive therapy, transitional therapy, and preventive therapy. Being an uncommon condition, there is a paucity of large-scale controlled trials and evidence of various therapies are based on smaller studies. This review primarily focuses on therapies with highest quality of evidence and also on the emerging therapies for CH. Paroxysmal hemicrania (PH) is a primary headache disorder belonging to the group of trigeminal autonomic cephalalgias(TACs). Patients typically experience intense lateralzsed headaches with pain primarily in the ophthalmic trigeminal distribution (V1) associated with superimposed ipsilateral cranial autonomic features. PH is distinguished from other TACs by an exquisite responsiveness to therapeutic doses of indomethacin. Patients may need to be maintained on indomethacin for several months before trials of reduction can be attempted. The disorder does have a tendency toward chronicity. PH is uncommon, but early recognition will prompt initiation of effective treatment to avoid unsuccessful trials of drugs effective in other primary headaches. As with other TACs, hypothalamic and trigeminovascular mechanisms are implicated in the pathophysiologic mechanism of PH. Neuroimaging findings in PH demonstrate a posterior hypothalamic activation similar to that observed in the other TACs. This review will address the epidemiology, clinical presentation, pathophysiology, evaluation, and treatment of PH. Hemicrania continua (HC) is an indomethacin responsive primary chronic headache disorder which is currently classified as a subtype of trigeminal autonomic cephalalgias (TACs). It is not very uncommon. There are >1000 cases of HC in the literature, and it constitutes 1.7% of total headache in the clinic settings. Misdiagnosis for HC is very common at all clinical settings. A diagnosis of HC is missed even by neurologists and headache specialists. It is characterized by a continuous strictly unilateral headache with superimposed exacerbations. Just like other TACs, exacerbations are associated with cranial autonomic symptoms and restlessness. A large number of patients may have migrainous features (nausea, vomiting, photophobia, and phonophobia) during exacerbations phase. The “key” feature of HC is persistent featureless background headaches. However, patients and physicians may focus only on the exacerbation part. As durations, frequency and associated symptoms of exacerbations are highly variables; it may mimic a large number of primary and secondary headache disorders. Migraine and cluster headache are two most common misdiagnosed conditions. Another specific feature of HC is remarkable repose to indomethacin. A “complete” response to indomethacin is as “sine qua non” for HC. However, a few other medications may also be effective in a subset of HC patients. Various surgical procedures have been tried with mixed results in patients who were intolerant to indomethacin or other drugs. 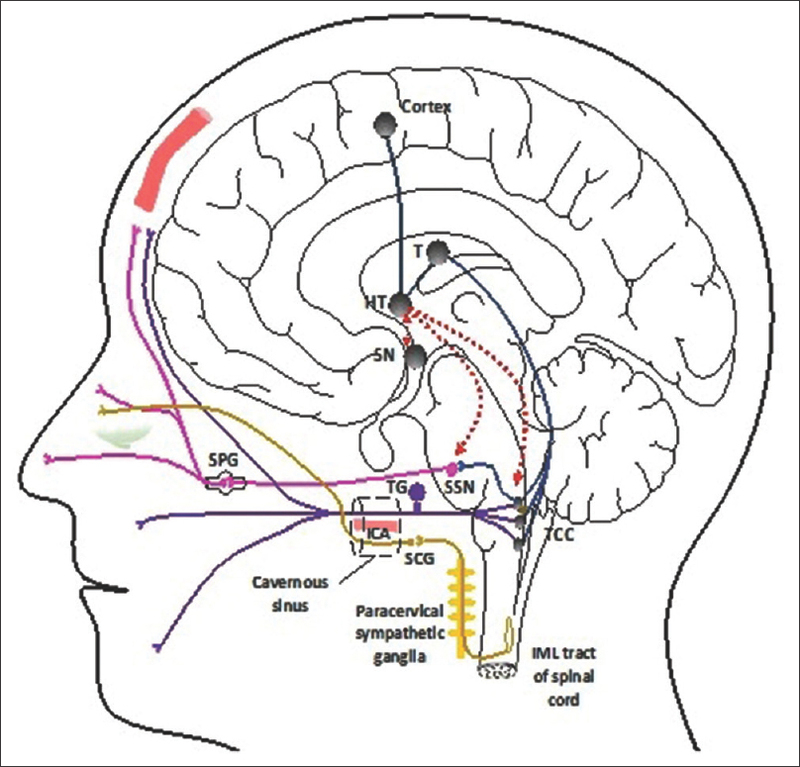 The term trigeminal autonomic cephalalgias (TACs) encompasses four primary headache disorders – cluster headache, paroxysmal hemicrania (PH), hemicrania continua (HC), short-lasting unilateral neuralgiform headache attacks with conjunctival injection and tearing (SUNCT)/short-lasting unilateral neuralgiform headache attacks with cranial autonomic symptoms (SUNA). All of these except HC are characterized by short-lasting headaches. HC is characterized by a continuous unilateral headache that waxes and wanes in its intensity without complete resolution. It is included in the TACs group given the overlap in the activation of the posterior hypothalamic grey, and the shared clinical feature of unilateral head pain with ipsilateral cranial autonomic symptoms. The present review gives an overview of the nosologic evolution, diagnosis, and management of TACs. The term “Trigeminal Autonomic Cephalalgia (TAC)” was first coined by Goadsby and Lipton to include a group of relatively rare primary headache disorders characterized by moderate to severe, short-lived head pain in the trigeminal distribution with unilateral cranial parasympathetic autonomic features, such as lacrimation, rhinorrhea, conjunctival injection, eyelid edema, and ptosis. In the current International Classification of Headache Disorders (ICHD-3 beta), the TAC group includes cluster headache (CH), paroxysmal hemicrania (PH), short-lasting unilateral neuralgiform headache attacks (SUNHAs) and their 2 subforms - SUNHAs with conjunctival injection and tearing (SUNCT), SUNHAs with cranial autonomic symptoms (SUNA). Hemicrania Continua (HC) is also now included in the TAC group. Although the entities included under TACs seem broadly similar, they differ in attack duration, frequency and their response to different treatments. At one end of the spectrum lies CH, the prototypic TAC where the duration of attacks is the longest and at the other end is the SUNCT syndrome where the duration is shortest. There is some overlap across the entities; they are not difficult to recognize and subclassify. The umbrella term “TAC” for the short-lasting headaches with autonomic features was for the first time introduced in The ICHD, 2nd edition (ICHD-2) published in 2004. The beta version of the 3rd edition of The ICHD was published in 2013. Headache classification being an evolving process, there have been some changes within the TAC group between ICHD-2 and ICHD-3 beta., Diagnostic criteria have been revised to reflect pathophysiological and clinical observations. Neuroimaging has provided insights into the pathophysiology of TACs. Functional neuroimaging has helped to elucidate key structures activated during attacks of TACs. Correct diagnosis remains the key to correct management of the TACs because treatment options vary. The aim of this article will be to highlight the changes in ICHD-3 beta to this group and to emphasize the clinical implications of these changes. Description of individual entities included under TACs are included elsewhere and will therefore not be detailed here. 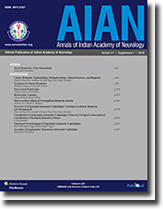 Functional neuroimaging was able to identify key structures for the pathophysiology of trigeminal autonomic cephalalgias (TACs) including cluster headache, paroxysmal hemicrania, and short-lasting unilateral neuralgiform headache attacks with conjunctival injection and tearing or cranial autonomic features and hemicrania continua. The posterior hypothalamus was the structure most consistently depicted with functional imaging in different states of disease with and without pain. 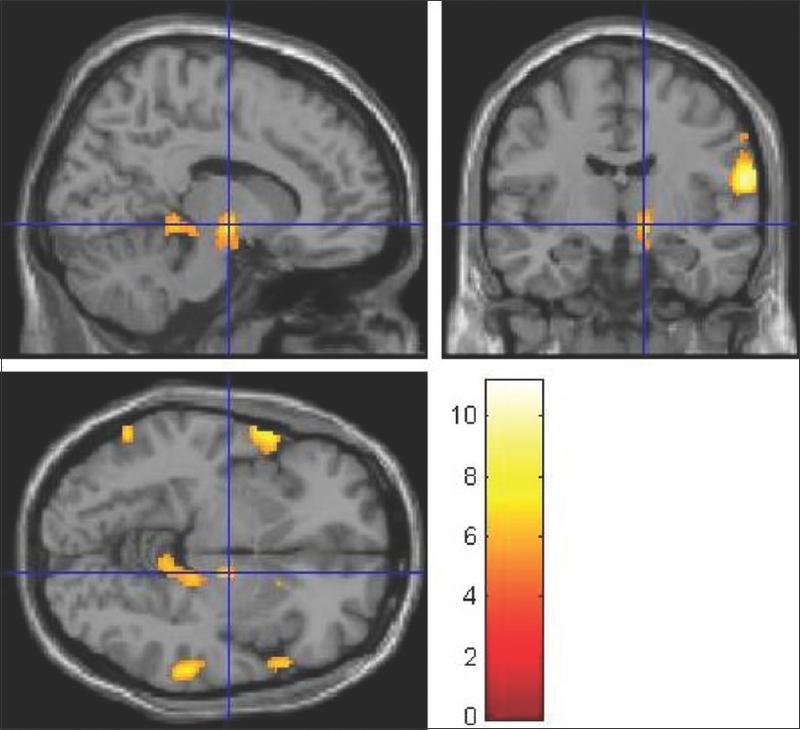 Network-oriented imaging techniques such as resting-state functional resonance imaging were able to show a broader involvement of human trigeminal pain processing in the underlying pathophysiological mechanisms of the different TACs, highlighting similarities between this distinct group of primary headache disorders, while also demonstrating the differences in brain activation across these disorders. The most important clinical assignment for neuroimaging research from the treating physician remains the objective and reliable distinction of each individual TAC syndrome from one another, to make the correct clinical diagnosis as the foundation for proper treatment. More research will be necessary to fulfill this unmet need. Primary trigeminal autonomic cephalalgias (TACs) are uncommon group of headache disorders. These are defined and diagnosed by the criteria given by the International Classification of Headache Disorders 3β version. Over the past few decades, a number of secondary (symptomatic) cases have been described in the literature with headache features indistinguishable from primary TACs. Many structural and other pathologies have been found in these patients that can be causally related to the headaches. This review attempts to critically analyze the existing literature including the new cases published during 2015–2017.